One of the curious things about the Brussels EU is that in promoting itself to the world it continually tries to rewrite, or even erase, some of the most important facts about its history. While there are many examples of this, nowhere is it perhaps more apparent than in the image it tries to present of Walter Hallstein, the man who was the first president of the European Commission, the unelected executive body of Europe. Hallstein held this post between 1958 and 1967 and is described on the Brussels EU website as a “visionary leader” and a “diplomatic force” who propelled European integration. However, no mention whatsoever is given by the Brussels EU to the fact that before and during World War Two Hallstein was a member of official Nazi organizations. For example, the Association of National Socialist German lawyers was founded in 1933, immediately after the Nazis had seized power. In 1936 it was converted into the notorious Nazi Association of Law Protectors. Membership of this second organization was restricted to those individuals showing uncompromising support for, and participation in, the implementation of Nazi ideology. 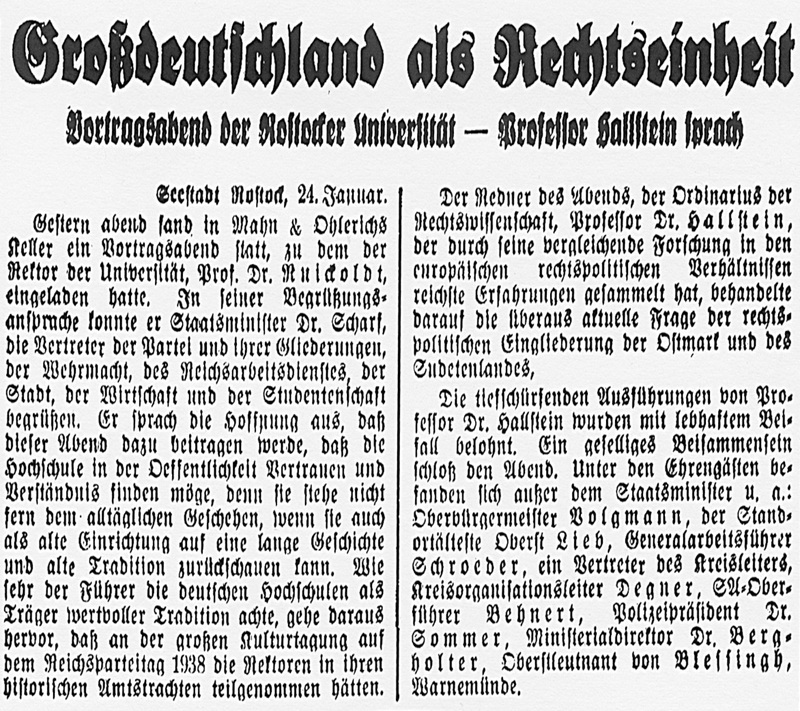 In a memorandum sent by Hallstein to the representative of the Nazi government at the university of Rostock in Germany in 1935, Hallstein stated he was a member of both these organizations. 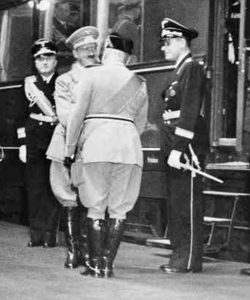 On 9 May, 1938, Mussolini welcomed Hitler at the station in Rome. But Hallstein’s role in these Nazi law associations was not simply a passive one. 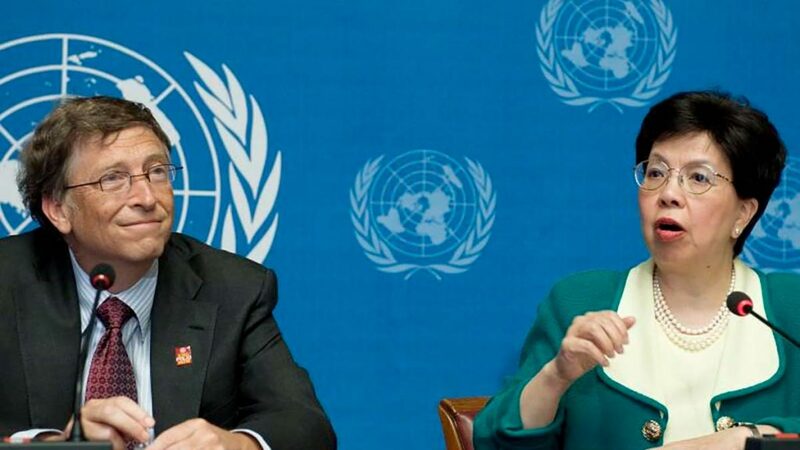 To the contrary, he played key roles representing the Nazi government in official state negotiations. In May 1938, for example, one year before the outbreak of World War Two, Adolf Hitler paid an official State visit to Italy to meet with Mussolini and initiate the planning for a future Europe under their control. This official Nazi State visit marked the beginning of some of the key preparations for World War Two – including the implementation of dictatorial laws across Europe. To this effect, a bi-national commission was established, including members from both Nazi Germany and Fascist Italy, with the primary goal of creating the legal basis for a European dictatorship. Only a few weeks later, the first meeting of this commission’s lawyers took place in Rome. One of the legal experts representing Nazi Germany at these official negotiations was none other than Walter Hallstein. 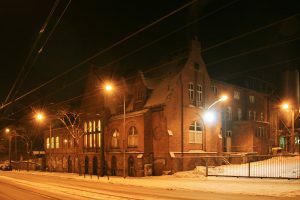 The site of Hallstein’s ‘Conquest Speech’, ‘Mahn and Ohlerichs Celler’ in Rostock, Germany, is still a landmark in the city today. But the thing that arguably tells us the most about Hallstein and his ideology is a truly astonishing speech he gave shortly before the outbreak of World War Two. He gave this speech on 23 January, 1939, in ‘Mahn and Ohlerichs Celler’, one of the largest convention sites in Rostock, Germany, at that time, which is still a landmark in the city today. A key aspect of the speech concerned what Hallstein referred to the “link up” of Austria with Germany, and with large parts of what used to be known as Czechoslovakia. He also specifically stated that the failure to create a “Unified Legal System” for this “Greater Germany” was “one of the unfinished tasks and failures of the Second German Reich.” The second German Reich, of course, covered the period through the final decades of the 19th century up to the end of World War One. So what Hallstein meant here was that he regretted the outcome of World War One and still supported its goals. Interestingly, Hallstein described the legal process for the creation of this “Unified Legal System” as being the issuing of Directives. Notably, when he eventually became president of the European Commission, essentially this same approach, the issuing of Directives, was chosen for its system of lawmaking – and it is still in use today. Hallstein also described the creation of this “Greater German Reich” as being “an economic event, of sheer unimaginable consequences.” So, to Hallstein, far from being about the invading and seizing of other countries, the creation of this “Greater German Reich” was simply a legal and economic matter. But perhaps the most shocking thing of all about this speech is that Hallstein stated one of the most important laws to be introduced in the annexed countries was the “Law for the Protection of the German Blood, and the German Honour.” In other words, he advocated the imposition of the Nuremberg Race Laws as a top priority in “Greater Germany.” These laws excluded German Jews from Reich citizenship and prohibited them from marrying, or even having sexual relations, with persons of German or related blood. You might be wondering how we know Hallstein said these things? Well, for one thing we have a copy of his original handwritten manuscript for the speech. We also have a copy of a newspaper report about the speech, that was published the following day after he had given it. 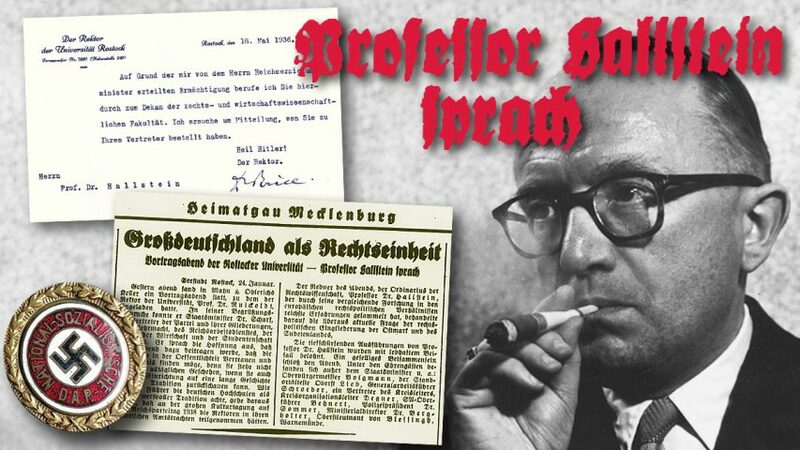 This report confirms the venue of the speech, the date of the speech, and it describes how the attendees included the entire elite of the Nazi state in the Rostock region. Additionally, we have a copy of the official invitation to the event. It too confirms the title of the speech, and the date of the speech. So we have multiple pieces of evidence that Hallstein gave this speech, and said these things. 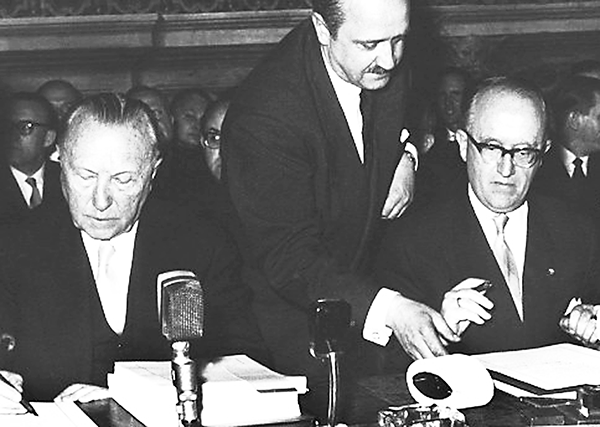 Walter Hallstein (right) signing the Treaties of Rome, the founding documents of the Brussels EU, on 25 March 1957. So we have to ask ourselves, how did a man like this come to sign the Treaties of Rome? The Treaties of Rome were signed in 1957, they were the documents that gave birth to the Brussels EU that we know today. How could a man with this ideology come to be sitting there with his pen poised, ready to change the future of Europe with his signature? This could surely only happen if there were people – and corporate interests – who wanted it to be like this. It is simply unthinkable that Hallstein could possibly be sitting there only 12 years after the end of World War Two, having participated in Nazi organizations, and having this ideology, but with nobody else present being aware of it. But in case you think Hallstein’s dictatorship mindset must surely have changed after the end of World War Two, think again. In his book, Europe In The Making, published in 1972, Hallstein proved definitively that his vision for a European dictatorship hadn’t changed. He wrote that the European Commission is entrusted with what virtually amounts to a monopoly in taking the initiative in all matters affecting Europe. There are few exceptions to this rule, he said, but they ought to be removed at the earliest opportunity. Hallstein also wrote that the unelected European Commission should eventually be empowered to take all measures necessary for the implementation of Europe’s laws, without having to rely on approval by even the Council of Ministers, the European body in which national government ministers meet. For the people of Great Britain, all this raises some profound questions – particularly regarding Hallstein’s relationship with former British prime minister Edward Heath. Walter Hallstein met with British Prime Minister Edward Heath on numerous occasions, and worked extremely closely with him in order to ensure that Britain joined the Brussels EU. After French President Charles de Gaulle had vetoed Britain’s entry into the Brussels EU during the 1960s, Heath invited Hallstein to Chequers, his prime ministerial country residence, to examine why the entry had failed. This visit was one of several that Hallstein made to Chequers during Heath’s time as prime minister. Behind the scenes, during the decade leading up to Britain joining the Brussels EU in 1973, Hallstein and Heath met on numerous occasions and worked extremely closely together. 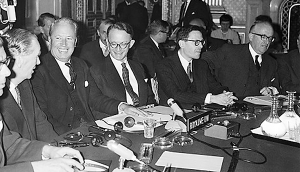 Hallstein and Heath were determined for Britain to join the Brussels EU, and stay in it, regardless of any opposition from the British people. 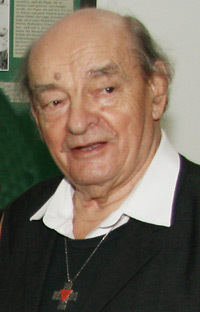 August Kowalczyk (1921-2012), former prisoner at Auschwitz and co-author of The Nazi Roots of the Brussels EU. In his forward to our book on the Brussels EU, August Kowalczyk, a former prisoner at Auschwitz, described how it is only through sharing the truth that we can reach a greater social openness, and begin the process of building a better Europe that is truly designed in the interests of its people. However difficult this might sometimes seem, however hard the historical facts are to face, the truth is – and always will be – our best route towards freedom, democracy, a better Europe, and a better world. Our Foundation is firmly convinced that, if the British people make the right decision on the 23rd of June, the first steps towards creating a better Europe, and a better world, will have been taken.